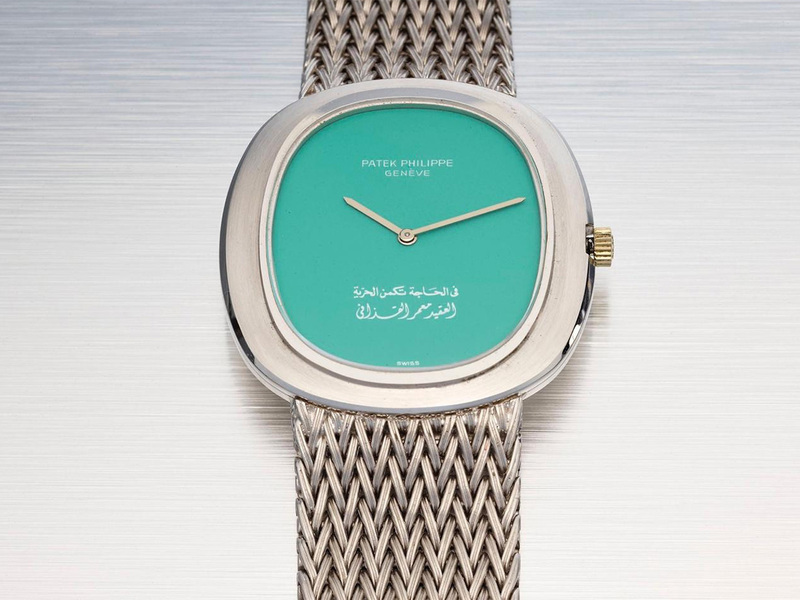 Dubai: As the final hammer came down on Christie’s rare watch auction in Dubai on Friday night, it was a Patek Philippe, made in 1979 at the behest of former Libyan strongman Muammar Gaddafi, that had stolen the show. Before the auction, the 18-carat gold, cushion-shaped wristwatch was initially estimated by Christie’s to sell for around $25,000. In the end, an anonymous bidder snapped it up for $193,750 (Dh711,000), a 675 per cent premium on the asking price. Sold by an unnamed “high ranking Middle Eastern official,” the watch features an inscription in Arabic on its pale green dial that reads: “Only in times of need will you find freedom,” accompanied by Gaddafi’s signature. Among the rarest example of its kind, Christie’s say that only two other models like it exist, one of which features the same saying in English. The watches were originally commissioned by Gaddafi to commemorate Libyan Labour Day in 1978, and later gifted to associates. Elsewhere, however, the auction found middling success after several years of record sales. Christie’s said that Friday night’s auction as a whole achieved just 69 per cent of its estimated value, whilst 29 per cent of the evening’s lots went unsold. This was reflected in the middle-of-the-road sales prices achieved by a number of the auction’s star watches. Another rare Patek Philippe, this time owned by musician Eric Clapton, was estimated to sell for between $550,000 and $850,000. It ultimately sold for $711,000. 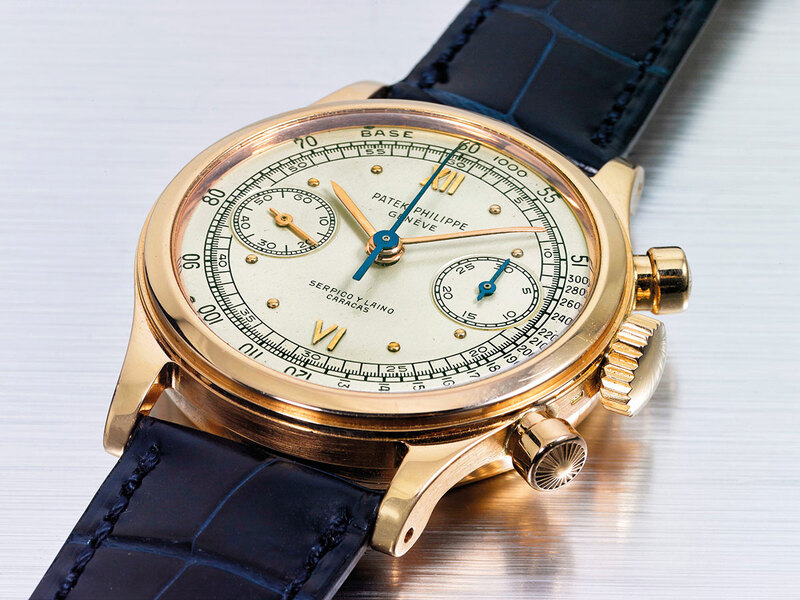 Likewise, an extremely rare 18 carat gold Patek Philippe wristwatch that was expected to sell for upwards of $1 million ended up going for just $591,000. A number of other top 10 lots failed to meet their upper-end expectations, selling for prices in the middle-to-lower-end of their valuation. Aside from the Gaddafi watch, there were a number of other successes, however. In a reflection of the growing popularity of large, complicated watches — especially among young Gulf collectors — an 18 carat diamond-set Hublot watch, along with a matching pair of cufflinks, a ring, and a pen, sold for $627,000, well above its $300,000 to $500,000 asking range. An 18 carat gold lady’s Graff wristwatch, featuring a “fancy vivid yellow diamond set”, sold for $531,000, over $300,000 more than its reserve price. Christie’s annual Middle Eastern art auction takes place at Emirates Towers on Saturday night.